After Charles Krause opened his gallery in 2011, he mounted shows of ideological and dissident art from earlier eras, much of it related to his former career as a reporter for The Washington Post and other outlets. But current events overtook the venue, recently transformed into the nonprofit Center for Contemporary Political Art. Its first exhibition, “Defining the Art of Change in the Age of Trump,” is heavy on breaking news. Not all the more than 100 artworks directly address the current administration, but the show is not recommended for anyone suffering from Trump fatigue. And skillfully made as they are, such visual polemics probably won’t age well. 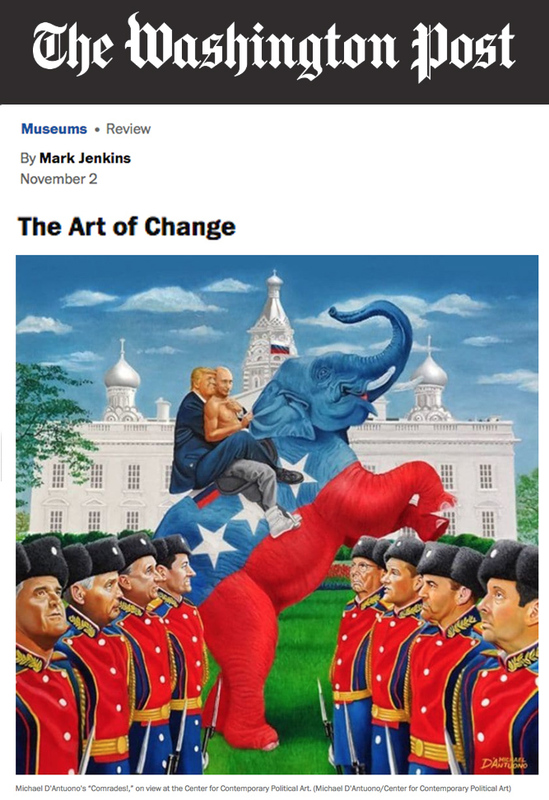 Satirical realist painter Michael D’Antuono depicts the presidents of the United States and Russia together on a rearing red, white and blue elephant, flanked by a palace guard of prominent Republicans. George Kennedy parodies Norman Rockwell’s four-freedoms illustration, interjecting Trump and his circle. Patricia Isaza uses real straw for the president’s hair in a fierce sculptural rendering. Kevin Champeny’s Trump portrait is made of hundreds of tiny plastic hands with upturned middle fingers. Defining the Art of Change in the Age of Trump Through Nov. 14 at the Center for Contemporary Political Art, 916 G St. NW. 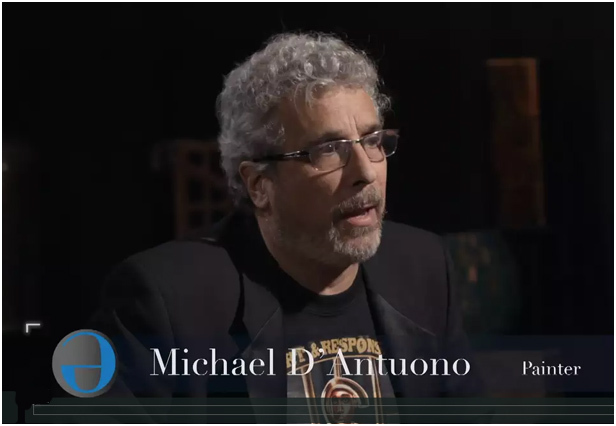 PBS’s Articulate segment, “The Last Refuge” hails the uncompromisingly dissenting art of Michael D’Antuono and that of two other artists as patriotic. The piece celebrates the importance of the artist’s role in sparking social justice. How much impact on can one piece of art have? Primarily through news clips, this video explores several controversies across the country in response to Michael D’Antuono’s provocative painting depicting the rampant racism that’s deeply embedded in our criminal justice system, “A Tale of Two Hoodies.” The video covers eBay’s banning of the piece when the artist attempted to auction it to benefit the Trayvon Martin Foundation in response to eBay allowing George Zimmerman’s to auction his painting for $100,000. The video also covers the firing of an Arizona high school social studies teacher over her including the piece in a final exam. Then the video takes us to Kentucky and Colorado where students were bullied to remove their homages to D’Antuono’s piece from public exhibition.